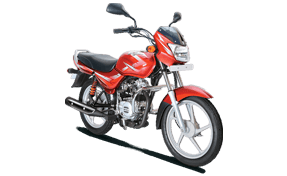 The Bajaj CT100 is the renowned name in the bike industry. It has now been updated with the amazing features and specifications. The electric start in the same bike has been launched at an amazing price of 38,806(ex-showroom price, Maharashtra) while the actual price in the market is if Rs 41,997. Under the CT100 model, there are 4 variants of the same. Moreover, Bajaj CT 100 has now come out with allow wheels. The new Bajaj CT100 ES is around Rs 7000 more expensive than the bare bones CT100 B that comes with kick start. The new Bajaj CT100 Electric Start carries a new decal design, as well as the addition of a fuel gauge with the flexible side indicators. The plus point about this bike is the comfortable and long seat that is great for normal commuting and for rider perspective as well. The bike maker's SNS (Spring in Spring Suspension) technology will help a lot in counter the most difficult road situations. With great power, the Bajaj CT100 ES is consist of 102 cc single-cylinder 4-stroke engine tuned to produce 7.6 bhp of power and 8.24 Nm of peak torque. The motor is paired with a 4-speed gearbox. The bike also comes along with the drum brakes which are present at the front and rear on all variants. The Pune-based bike maker offered this great model in three color options - Black with silver and red decals, Black with silver and blue decals, and in Red. The front look of the same bike is represented with drop down headlamp and a black colored visor. Its amazing chiseled fuel tank helps you in getting a good and comfortable riding position to the rider and great for longer journeys. The seats of this bike are designed perfectly with proper cushion for both the riders. A trapezoidal tail lamp and rectangular shaped turn indicators distinguish the rear look of this bike. Its instrument panel is really designed very well that houses an analog speedometer, odometer, fuel gauge all of which tells the rider the position of the bike in real time. Bajaj CT100 colors include shades of Ebony Black, Electric Blue, and Candy Red. There are several reasons to opt for this bike. You will be happy to see its specification and looks. This is an affordable bike from Honda. It will come out with the great specification that truly amazes you. The bike is completely based on a tubular single down tube with lower cradle frame with overall dimensions of 1,945mm in length, 770mm in breadth and 1,072mm in height. It has a wheelbase of 1,235mm and its ground clearance is 169mm. Bajaj CT100 boasts a 2.75 x 17" 41P tyre at the front and 3.00x17" 50P tyre at the rear. Bajaj CT100 features also include 110mm drum brake for both the front and the rear tyres, hydraulic telescopic shock absorber at the front and trailing arm with a unique coaxial spring SNS suspension at the rear. Among all the options by Honda, this is something that you must look for. This is a great bike at an affordable price. It has great looks and specifications which makes it amazing. Insurance is a must thing that you should own. In Indian, it is illegal to drive on the roads of India. As per the Indian vehicle act, it is compulsory to buy a two wheeler insurance if you own a two-wheeler. You can’t drive legally on the roads of India, without a valid two wheeler insurance plan.